I Will Survive … A Grad Cover Version You Must Sing! 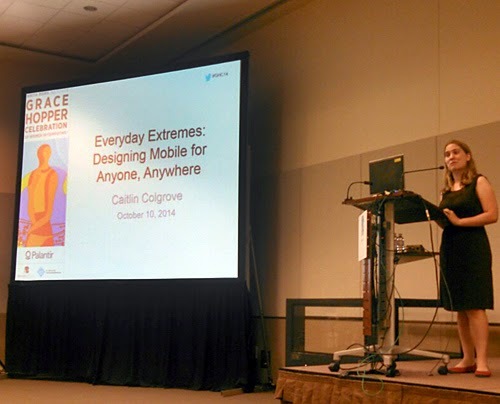 Caitlin Colgrove presenting on extremes in mobile design. Of the 6 HCI talks presented on the last day of GHC, 3 were website-related and 3 were mobile device-related. I know these two areas (websites & mobile devices) have a strong presence in our everyday lives and there’s still much to learn and actually execute in terms of their usability – especially as technology continues to evolve. However, I would have liked to have seen at least one presentation related to some other type of human-computer interaction – automobile dashboards, airport kiosks, gas pumps, etc. Rather than try to cover all 6 presentations in this post, I’ll focus on my favorite and then end with my biggest takeaway from each. My favorite presentation was Everyday Extremes by Caitlin Colgrove because she touched on HCI concepts I find most fascinating: context. She encouraged us not to view mobile as “just a miniature version of a desktop” and to consider the extreme conditions that mobile users encounter on a daily basis. The case studies she brought up highlighted the importance of observing how environment impacts usage. One great example was when her team was tasked with deploying an interface law enforcement officers would use in their cars. They noted the laptops in the officers’ cars had hard-to-press, pressure-based touch screens that were even harder to press when the vehicles were moving. They noticed that officers would brace the screen with their one hand (usually right hand) and use their thumb to press. So, they designed for this, putting the interface’s navigation controls in the upper right. She also advised us to check out the blog post “Design for Realtime” by Dominic Nguyen. This hit home when, following the presentation, I decided to continue my note-taking outside where it was warmer. I kept my laptop open, walked out the closest door and sat out front of the convention center. I finished up my notes in the wiki, hit Save and … eeek … a “no connection” screen. I didn’t realize that I’d lost connection to the conference center wifi went I walked outside. I hit the Back button, but it was too late – all my notes were gone. Luckily, I’d done an earlier save of my wiki notes into a Word doc so I was able to repost everything. We have a dominant nostril that changes several times a day. From the quite interesting and entertaining talk "Hitting Authentication on the Nose" by Ann-Marie Horcher. The discussion of the Couple app (which I loved using during my 2 years of long-distance dating my now husband!) and how it allows you dedicate a “space” on your device for the person you love, similar to how you might dedicate a particular ringtone. From "Distractedly Intimate" by Cate Huston. When we think about making websites more accessible, imagine we’re fixing a site for Stephen Hawking or for our future older selves. Great perspective from "Web Accessibility for Everyone" by Ramya Sethuraman. Cities are only just now exploring how digital technologies can connect them to their citizens. From "Designing for a Digital City" by Carolyn Pang. Great talks overall. I've posted my notes and look forward to seeing the speakers provide slides. Maybe next year, I'll have to be the one to present my observations on gas pumps! Don't let the networking die! Today marks a week since Grace Hopper began. Have you followed up on the connections you made? I’ll be the first to admit I have no problem meeting new pals, I sometimes have issues following up with them. Please don’t let those good ole times spent bonding over waiting to get your caricature drawn or stalking the snack areas go to waste! I have their business card.. I recognize it may be a little weird making the first move but people do it all the time. Deep breath and send that email! What you’d like to do with your new found personal/professional friendship. In a crowd of 8000 people there’s a countless number of possible interactions. It’s perfectly normal to not recall how or where you met exactly. I’ve found touching base on a higher level is normally the best option. This year may have been my 4th year attending Grace Hopper but boy did it leave a lasting impression on me. This by no means is a complete list but I managed to track down a few people on Twitter. Feel free to follow them. Below are some communities you'd want to follow if you'd like to be more involved or stay up to date with the happenings of Grace Hopper. We can't wait to see you in Houston!